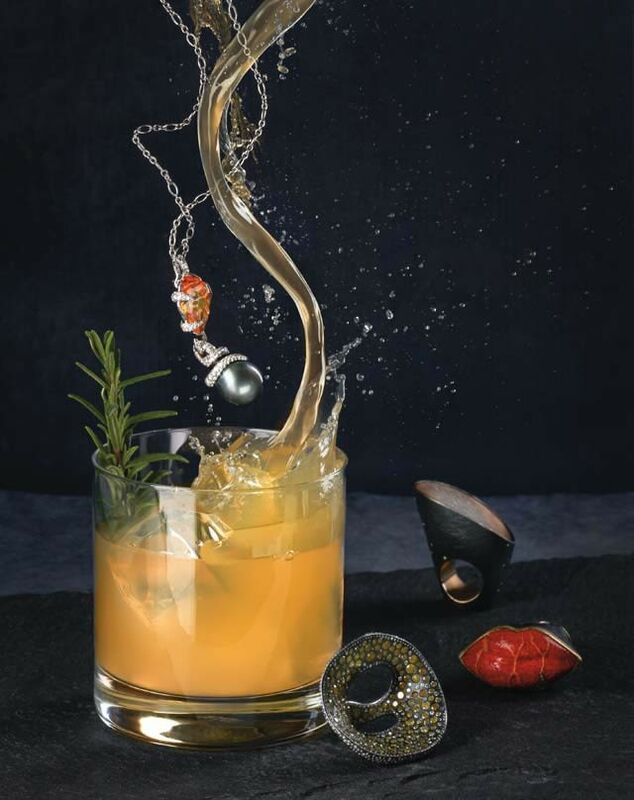 Bespoke herbal cocktails that walk the line between strong and soft meet statement making jewelry pieces—the perfect combination for your rehearsal dinner. Strip lower part of rosemary into tin, add St. Germain, dry muddle. Add tequila, grapefruit, lime and shake. Dump into a Collins glass, add the tip of the rosemary as garnish. Serve with long straws. Vintage coupe from Fanciful Rentals (price upon request). 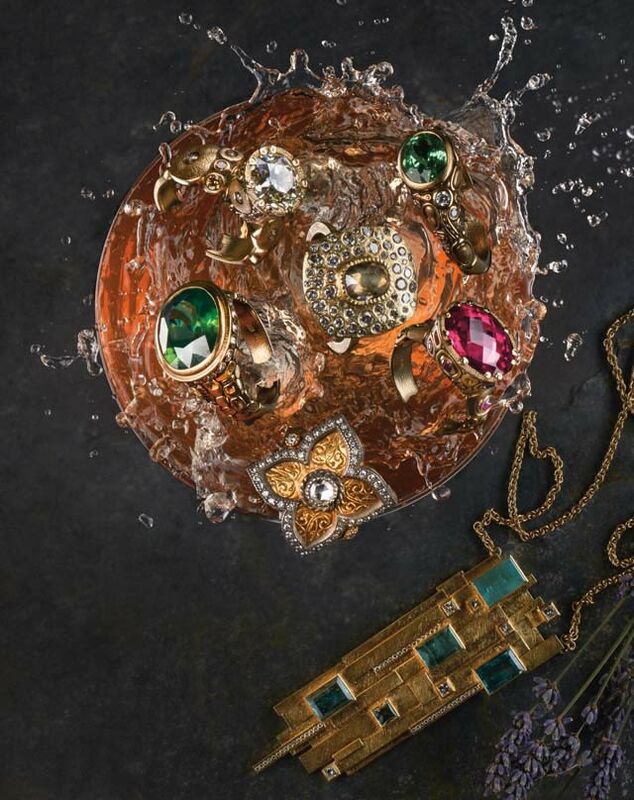 1) Tsavorite garnet, 22K gold, and aged sterling silver locket by Arman Sarkisyan, $3,780 2) Crownwork champagne diamond and 18K yellow gold Egg Pendant by Ray Griffiths (price upon request). All jewelry available at Fox’s Seattle. To make rosemary-infused Calvados, drop 5 rosemary sprigs inside a bottle of Calvados and let sit for 5 days or until desired flavor is achieved. Combine all ingredients into a shaker, shake, and pour into your choice of glassware (rocks glass or up), with a rosemary sprig for garnish. 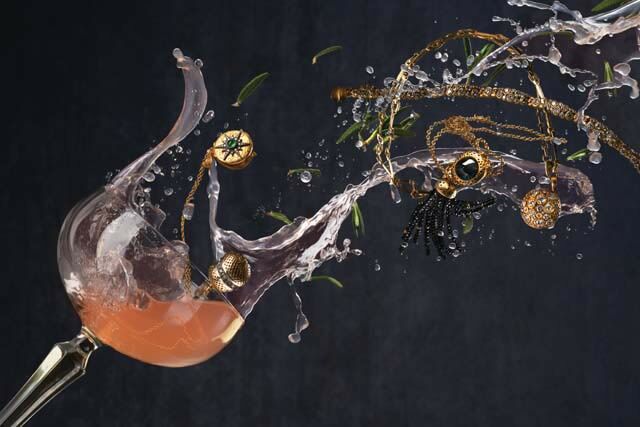 1) Black South Sea pearl with fire opal diamond and 18K white gold pendant by Mikimoto Couture (price upon request) 2) Diamond and 18K rose gold and silver ring by Todd Reed and Zobel, $8,500 3) Coral lip and 18K gold and silver ring by Todd Reed and Zobel, $13,500 4) Multicolored diamond and sterling silver ring by Todd Reed and Zobel (price upon request). All jewelry available at Fox’s Seattle. Combine all ingredients in a shaker. Stir with a sprig of fresh lavender. Serve over rocks with a fresh lavender sprig. Clockwise, from top left: 1) Orchard Ring, with old European cut center diamond (2.97 ct), fancy colored diamonds, and 18K yellow gold by Alex Sepkus (price upon request) 2) Multicolored diamond and 18K yellow gold ring by Todd Reed (price upon request) 3) Mint green garnet diamond and 18K yellow gold ring by Alex Sepkus, $7,500 4) Little Windows ring, with rubellite tourmaline fancy sapphire and 18K yellow gold by Alex Sepkus, $19,980 5) Lotus Ring, with rose cut diamond, 22K gold, and aged sterling silver by Arman Sarkisyan, $6,270 6) Little Windows ring, with green zircon diamond and 18K yellow gold by Alex Sepkus, $8,400 On bottom right: 7) Aquamarine diamond and 18K yellow gold necklace by Todd Reed (price upon request). All jewelry available at Fox’s Seattle. Combine green tea gin, lemon juice, and agave in a shaker. Stir to combine and pour into a flute. Top with Champagne or sparkling wine. 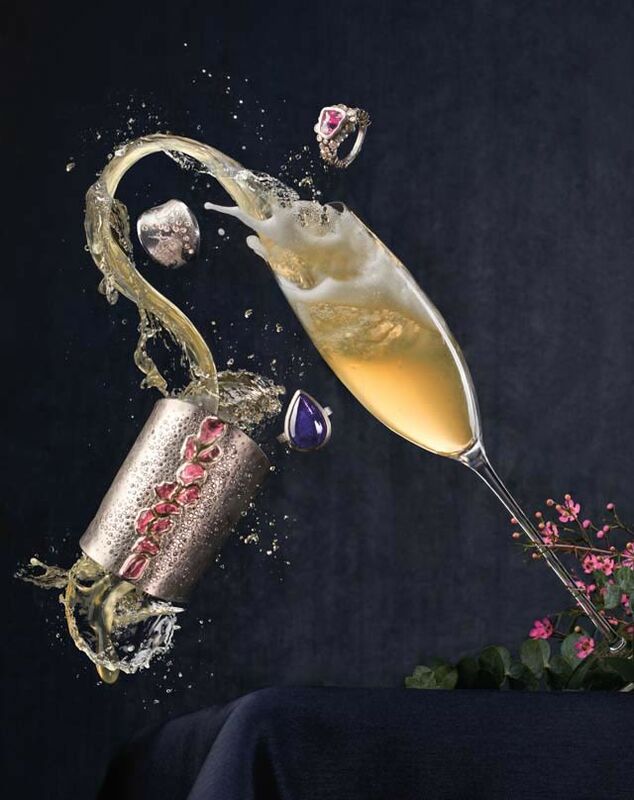 1) Bubble ring, with organic pink sapphire diamond and palladium by Todd Reed, $12,915 2) Diamond, silver, and platinum ring by Zobel, $2,950 3) Tanzanite and palladium ring byTodd Reed, $7,750 4) Tumbled spinel diamond and palladium cuff by Todd Reed (price upon request). All jewelry available at Fox’s Seattle.